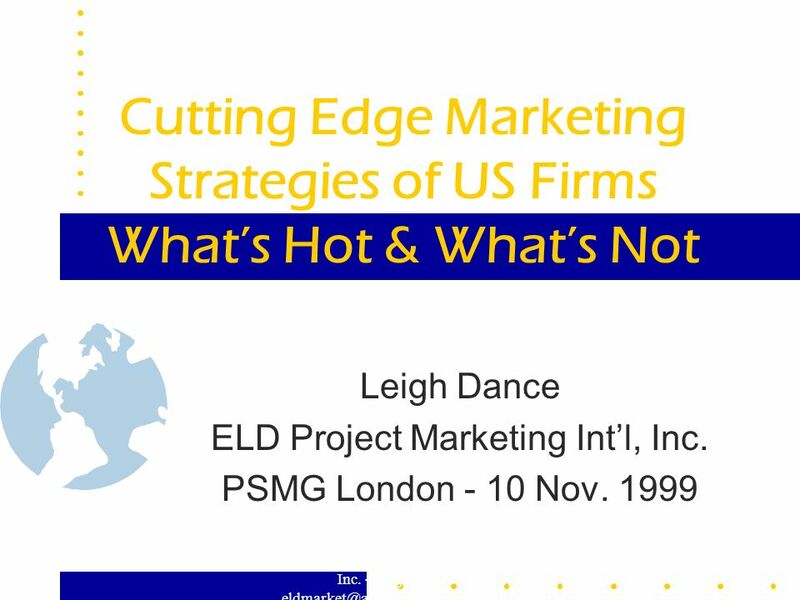 (c)1999, ELD Project Marketing Int'l, Inc. - Leigh Dance - 0 2007 Leigh Dance The reproduction, modification, or distribution. 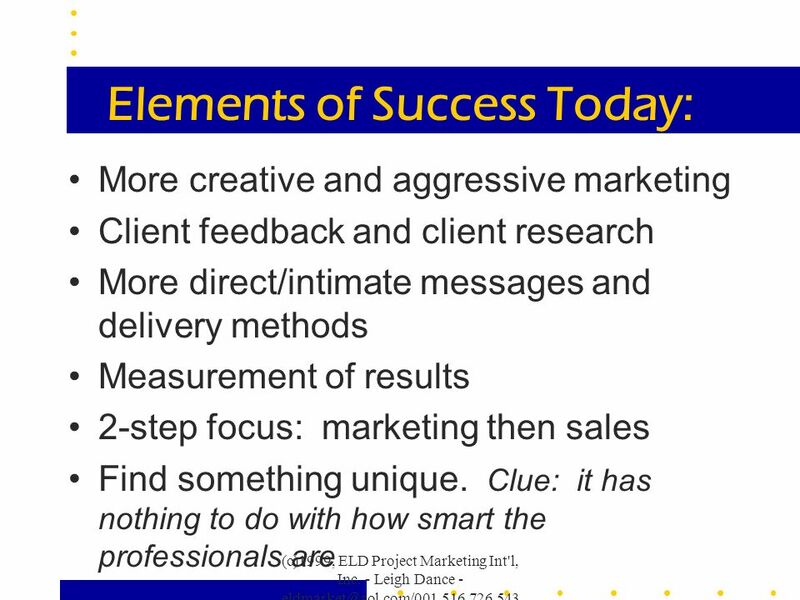 1 (c)1999, ELD Project Marketing Int'l, Inc. - Leigh Dance - eldmarket@aol.com/001.516.726.543 0 2007 Leigh Dance The reproduction, modification, or distribution by whatever means of the whole or any part of this presentation (including, without limitation, all images, logos, graphs, charts and quotes) is strictly forbidden without specific written permission from the author. 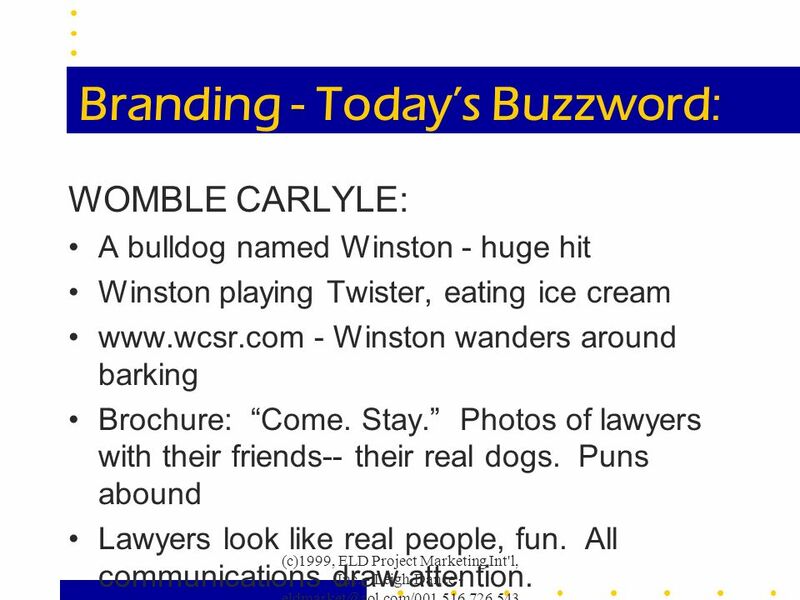 6 (c)1999, ELD Project Marketing Int'l, Inc. - Leigh Dance - eldmarket@aol.com/001.516.726.543 0 Branding - Todays Buzzword: WOMBLE CARLYLE: A bulldog named Winston - huge hit Winston playing Twister, eating ice cream www.wcsr.com - Winston wanders around barking Brochure: Come. Stay. Photos of lawyers with their friends-- their real dogs. 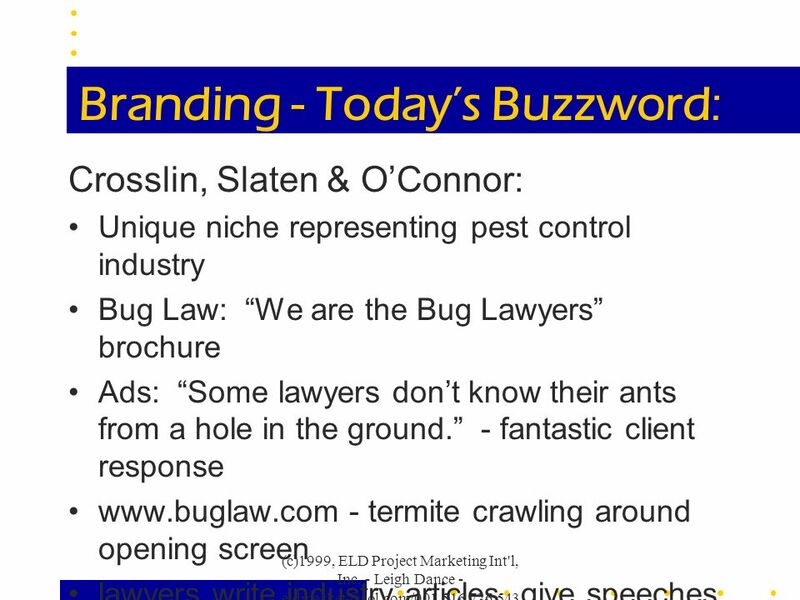 Puns abound Lawyers look like real people, fun. 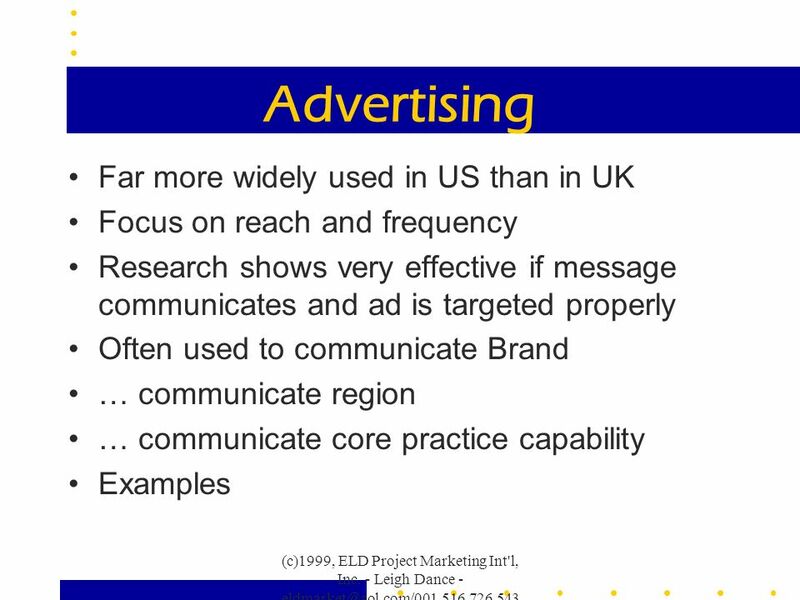 All communications draw attention. 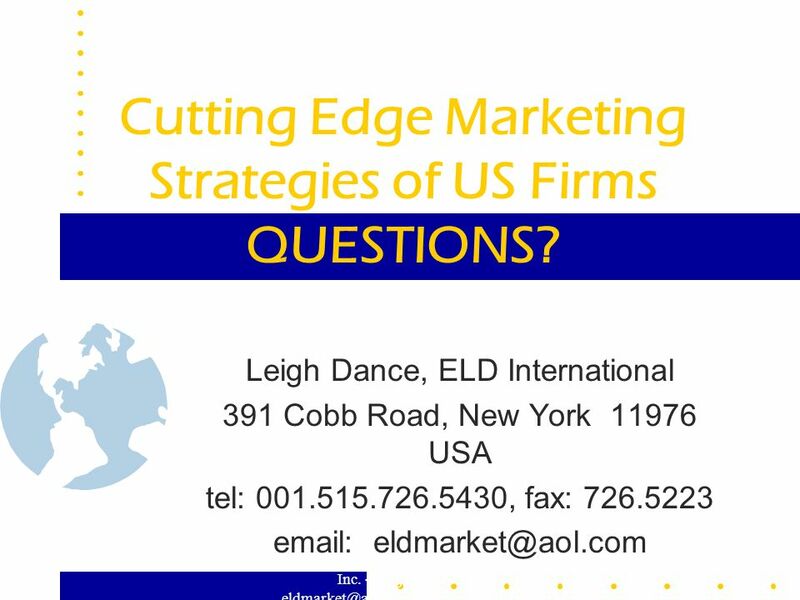 14 (c)1999, ELD Project Marketing Int'l, Inc. - Leigh Dance - eldmarket@aol.com/001.516.726.543 0 Collateral Materials Less fancy brochures, more targeted industry communications and programs Less newsletters, particularly broad topic ones Our firm is very old. 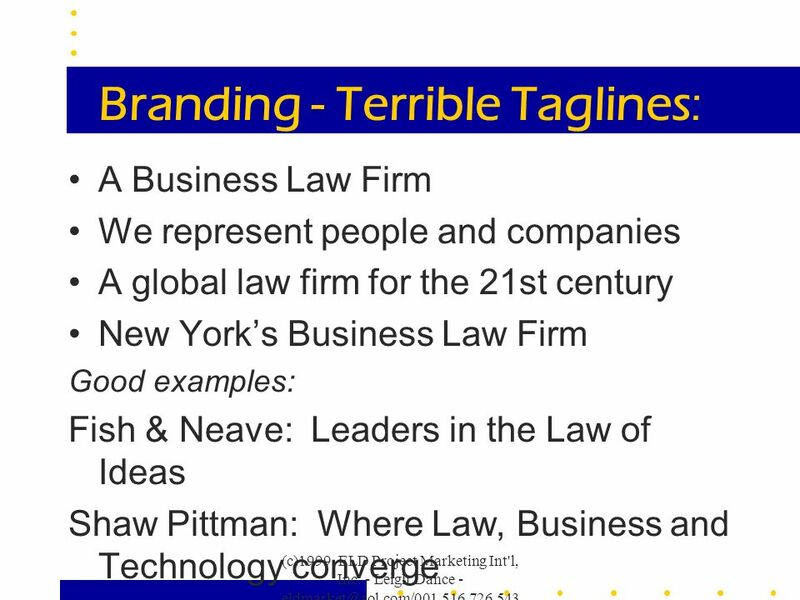 Were as good as the big firms only more cost effective… Our firm represents everyone, from individuals to Fortune 500 companies, in virtually every practice area (long list)… We do all of them really, really well. 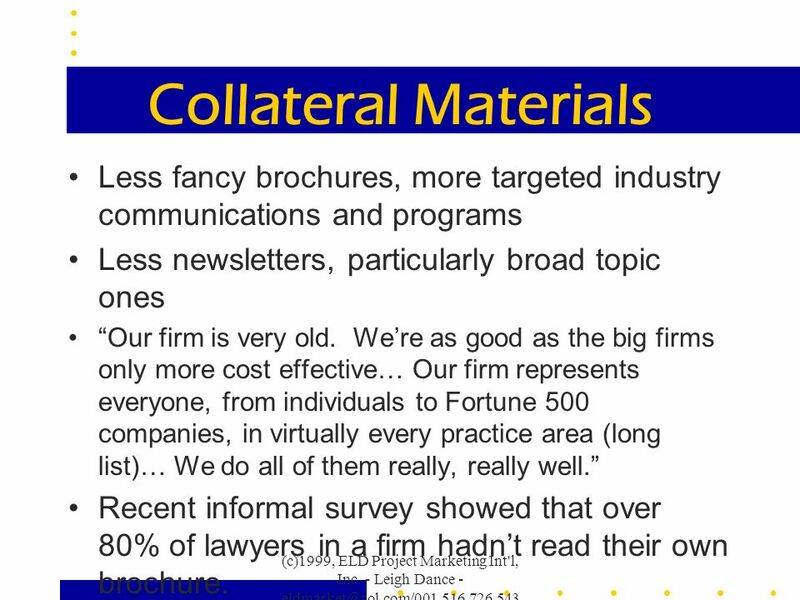 Recent informal survey showed that over 80% of lawyers in a firm hadnt read their own brochure. 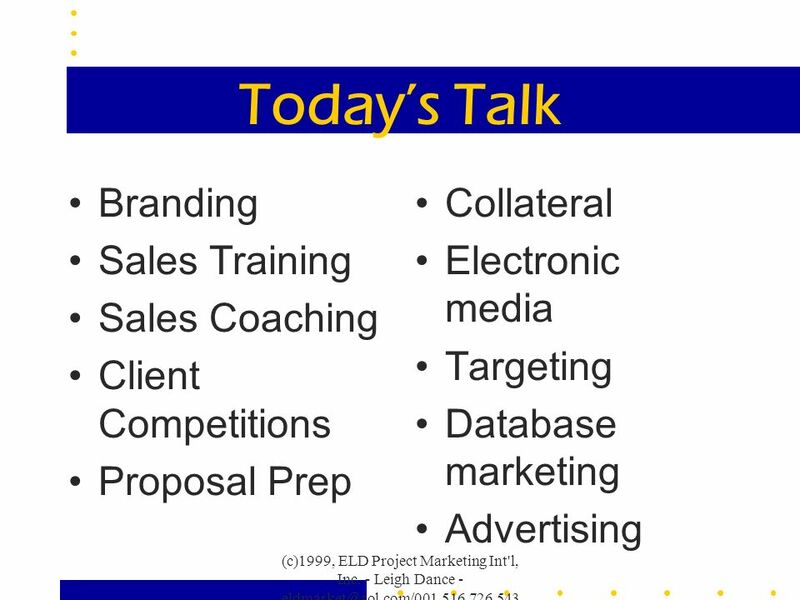 19 (c)1999, ELD Project Marketing Int'l, Inc. - Leigh Dance - eldmarket@aol.com/001.516.726.543 0 Whats Hot Better AV at seminars and presentations Alumni programs Shorter, more frequent client communications More collaboration with other service organizations Highly targeted, substantive briefings or seminars Marketing leading clients and prospects back to websites Technology rules. 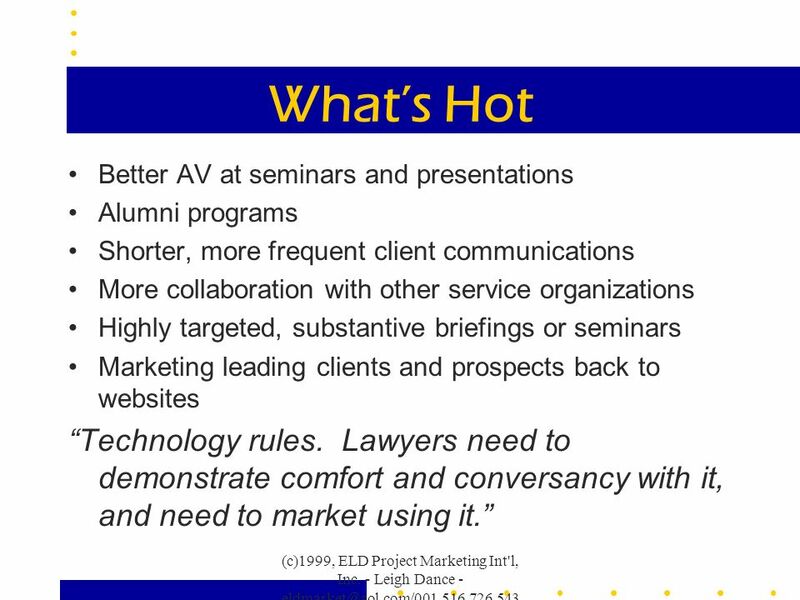 Lawyers need to demonstrate comfort and conversancy with it, and need to market using it. 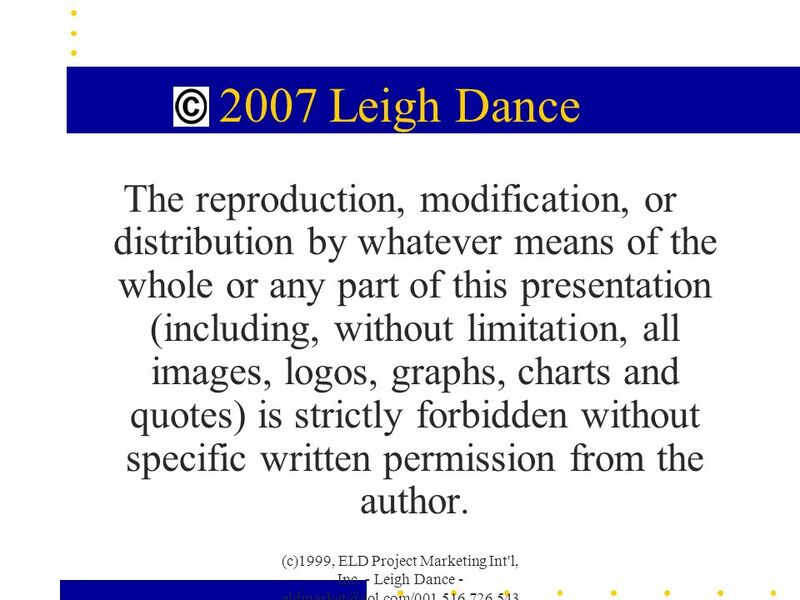 Download ppt "(c)1999, ELD Project Marketing Int'l, Inc. - Leigh Dance - 0 2007 Leigh Dance The reproduction, modification, or distribution." 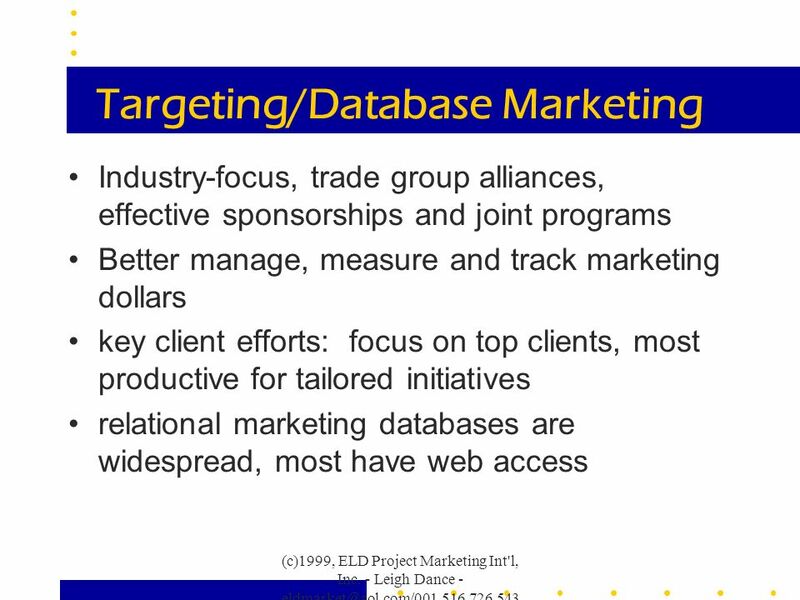 A Guide To CRM and Database Marketing By R.R. 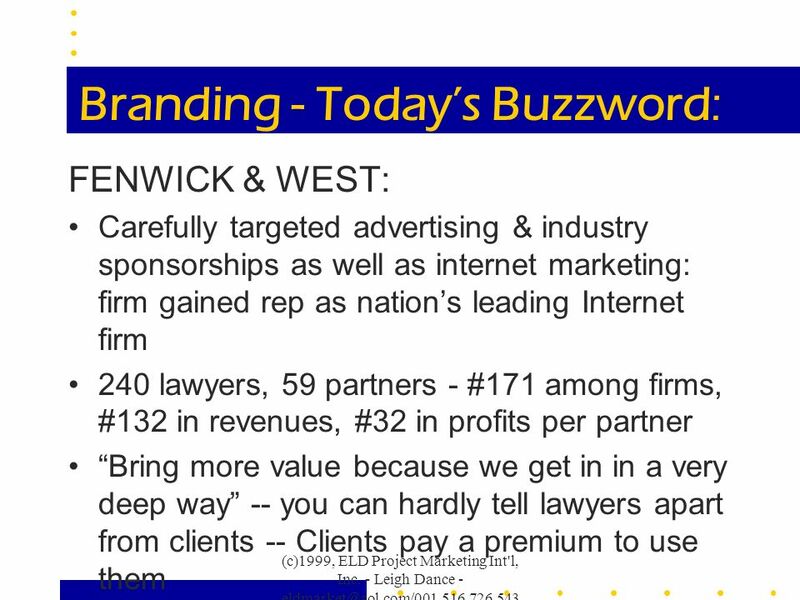 Jackson & Associates, Inc.
1 Websites – Are They or Are They Not a Necessity? Responses to New Consultants Questions. 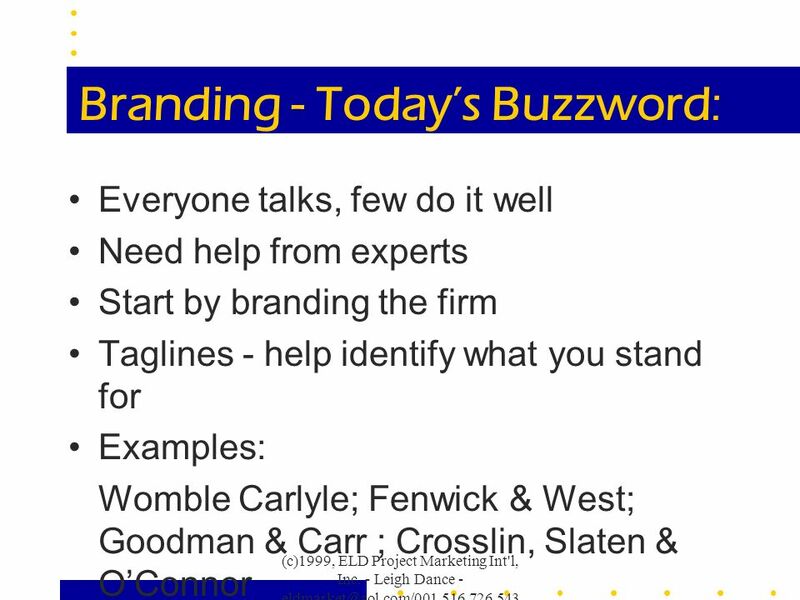 Marketing The Brand Called You! 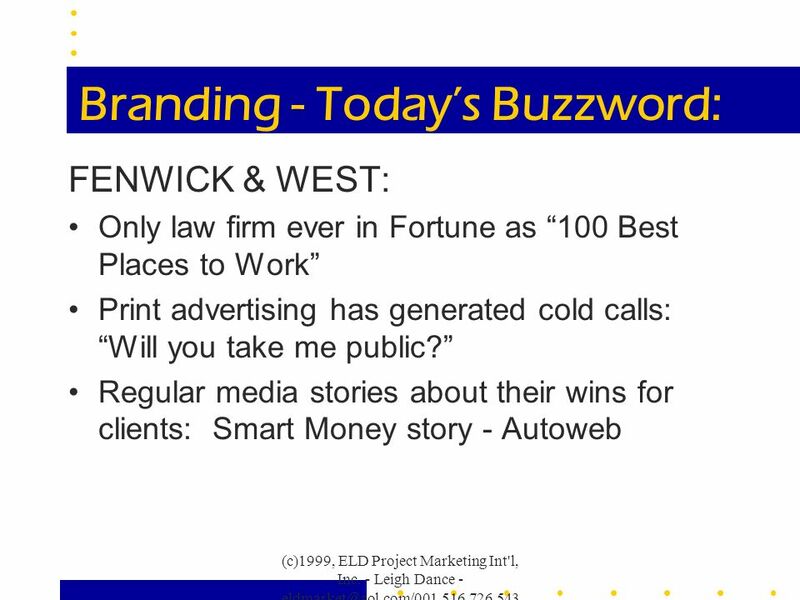 Marketing The Brand Called You! 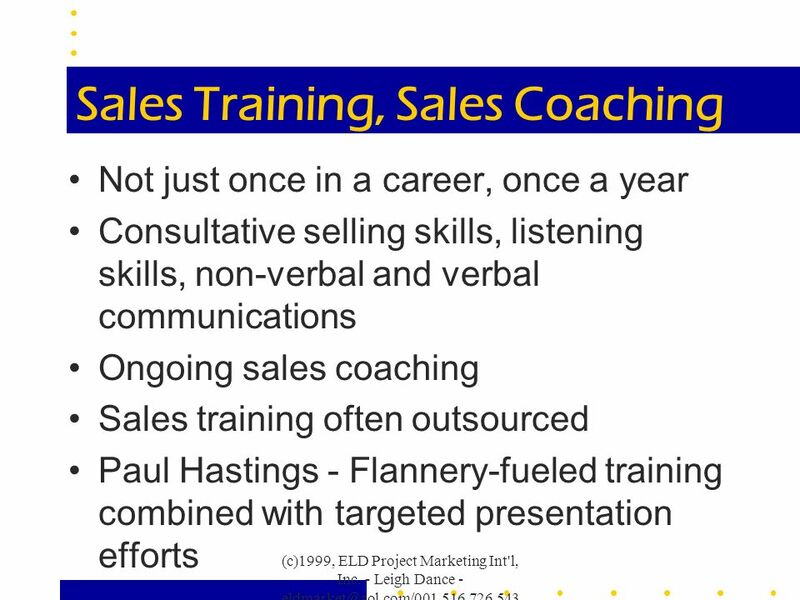 You & Your Career You & Your Career. 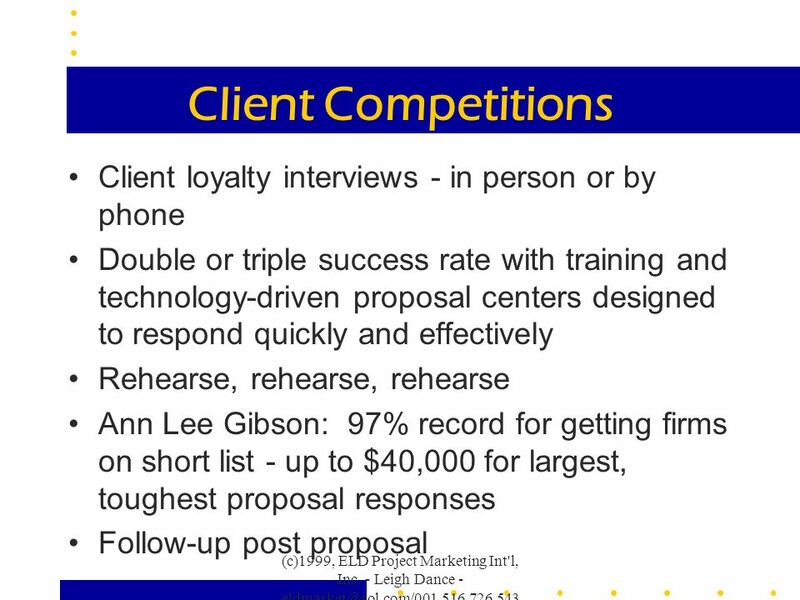 Recent Trends in Legal Services New Business Competitions Slide 1 Home Productivity Curve Client Trends Firm Trends 50 Tips Recent Trends in Legal Services. 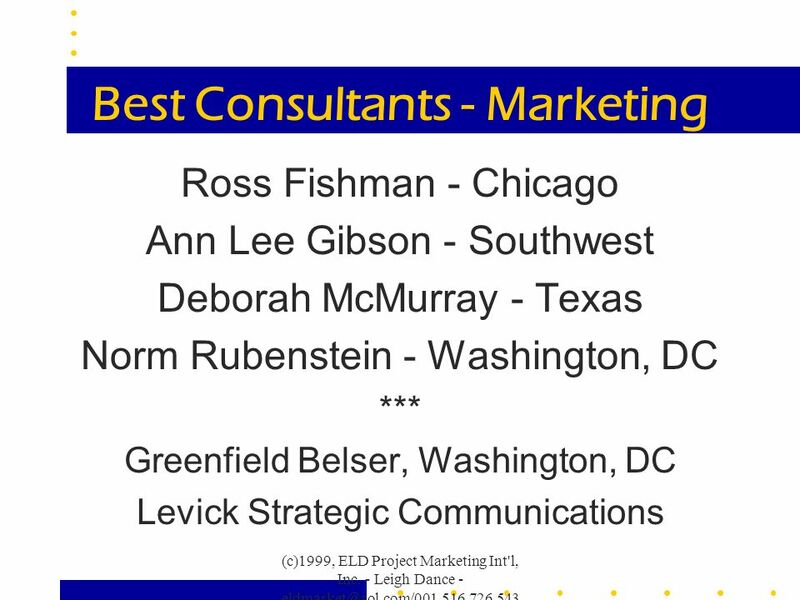 TR Design Nick Castellano Vienne Cheung Lauren Fleming Brian LaFlamme Ingrid Wallace. 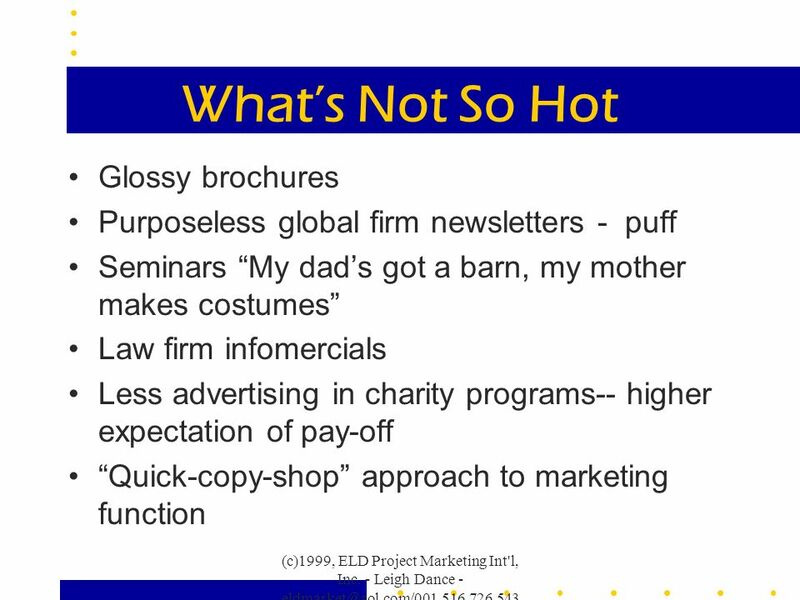 THE WORLD OF ADVERTISING Presented by : Rozz Algar – Group Marketing Director. 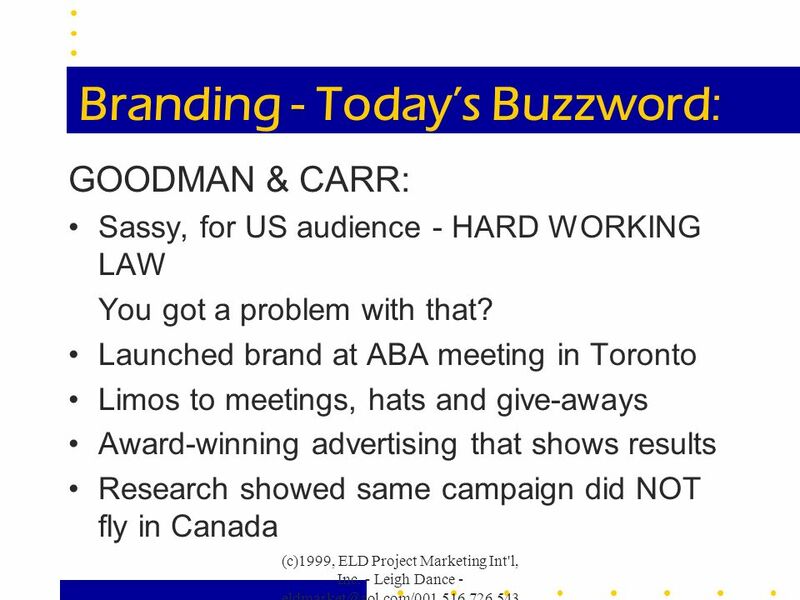 People are People & Ads are Ads Perspectives on B2B Copy Testing March 19, 2007. 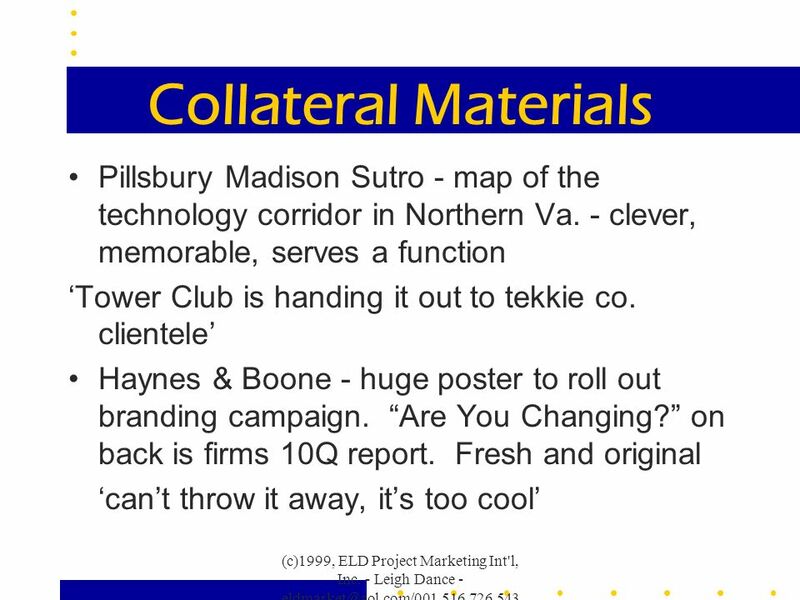 Offline & Online Marketing Go Hand in Hand. What?! Not Everything Involves the Web? ?